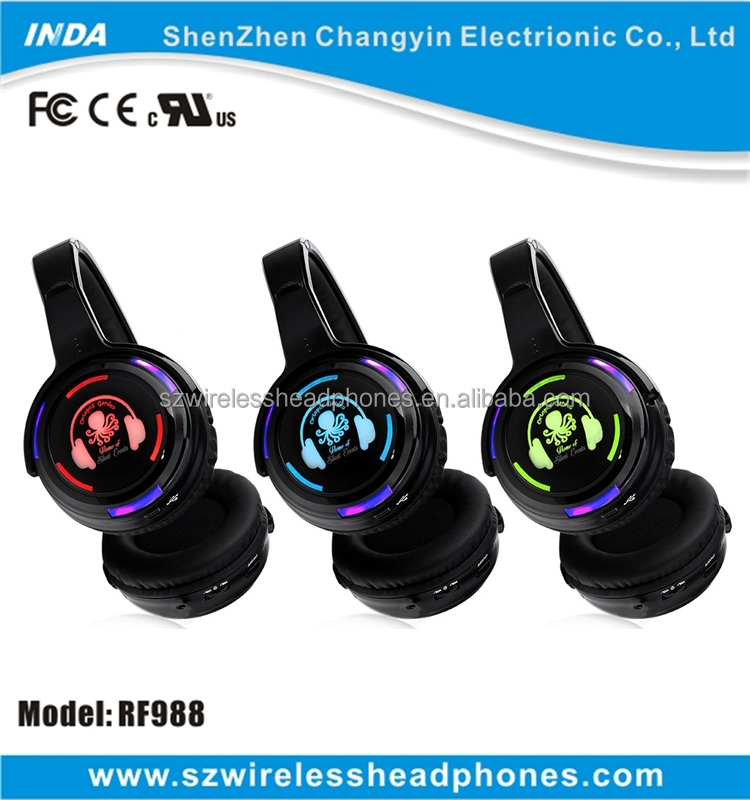 RF988 Silent Disco Wireless Headphones is the top sale model, with led light support blink according to music rhythm; customer laser logo optional, different laser logo color indicate different channels, very beautiful and easy to know the most popular music or DJ; built-in 600Mah A-grade rechargeable lithium battery, work time up to 8 to 10 hours;1 to 3 channels are optional. 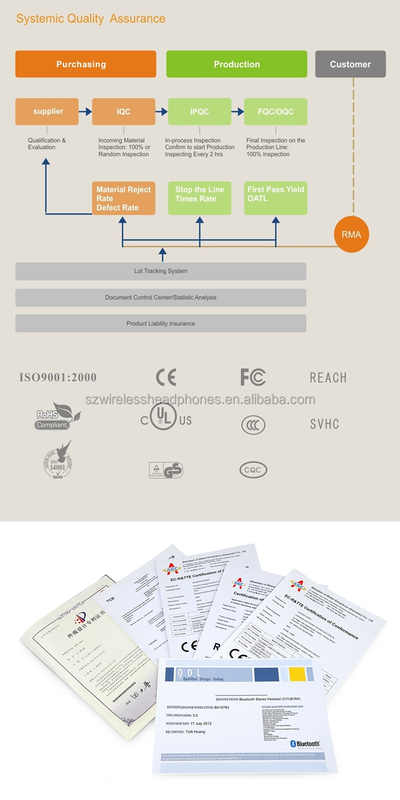 All materials and Silent Disco Wireless Headphones are 100% tested before shipment, with CE, RHOS, FCC certificate and 12 months warranty, full quality guarantee. 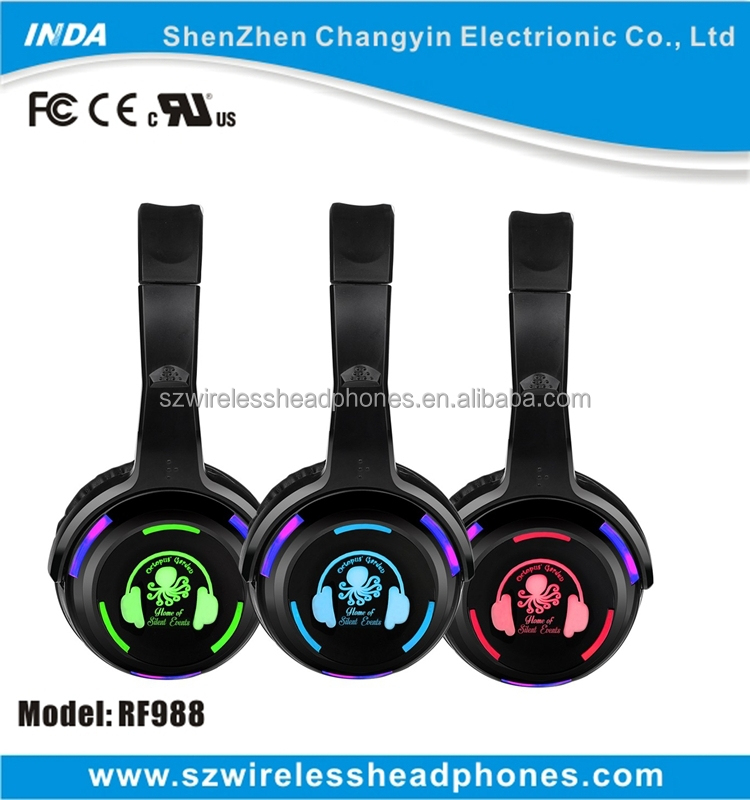 Especially designed for Silent Party, Wedding, Events, Cinema, Conference, Dance, Fitness Events etc. Very popular at Hotel, Club, Bar, Fair, Class, Gym etc Indoor or Outdoor activities. It's worth to own! 2.Transmits audio signal about 500M, through walls, floors and ceilings. RE: All headphones enjoy 12-months after-sale quality warranty. RE: Generally, 50-500M, with perfect reception through walls and ceilings. Q3: Where silent disco headphones can be used? 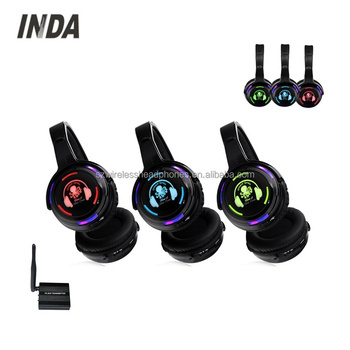 Q4: How many pcs of headphones can be used for one transmitter? RE:One transmitter can be used for endless headphones, as long as the space can hold so many people. Q5: How to charge Headphone? Maybe, it’s a headache to charge so many headphones at a time? 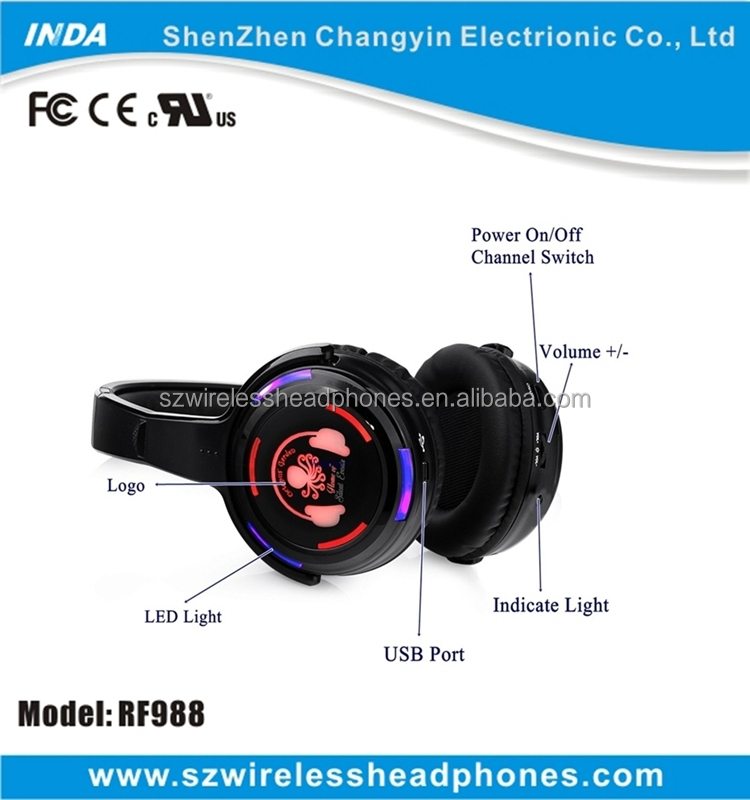 RE: Usually each headphone can be charged through connecting headphone to PC, via USB charge cable. Yet, to make charge solution easier, we can offer you one type of 16 port transformer, which can charge as many as 16PCS headphones at a time. Q6: Can i set 4 channels? RE: No problems. 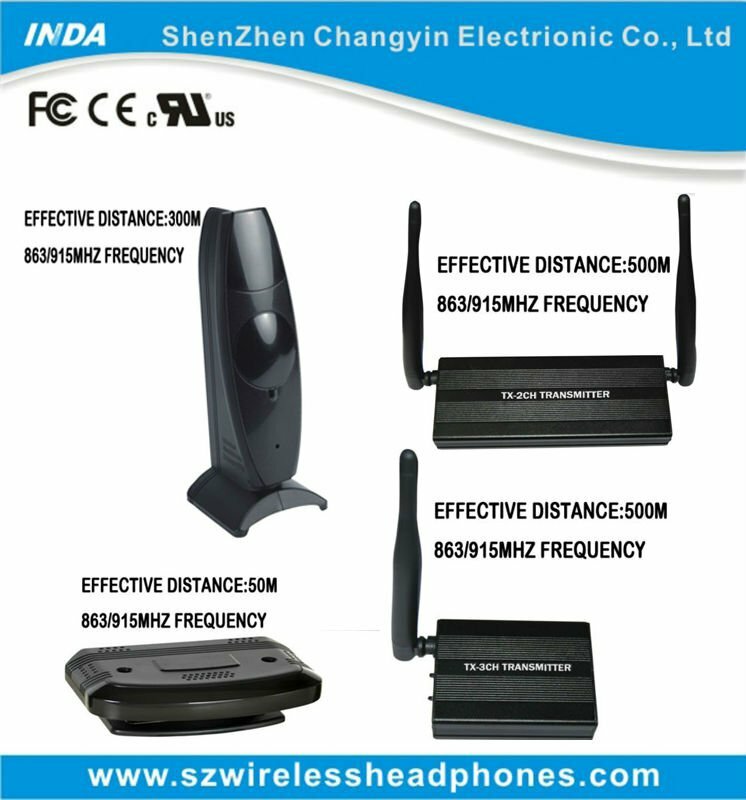 We can set many channels as you need. Yet, to avoid interference, 2 channels/3 channels/ 4 cannels arerecommended. Price the same for 2/3/4 channels. Q7: How long it takes to receive the goods? RE: 3 to 5 working days for sample; 20 to 30 working days for bulk order.